A brilliant book on freelancing – mainly in the graphic design business. It’s written by two freelancers with lots of experience, and ranges through from whether or not you should be a freelancer through to finding success and expanding your business. The book looks lovely, it’s well laid out and type-set, and the front cover is gorgeous. The book is peppered of little line drawings and there is an ongoing orange and turquoise colour theme with text and supporting graphics, which makes this book seem very laid back and a little quirky. The book is made up of 8 chapters, leading you through from deciding whether or not to become a freelancer, through to the beginnings, marketing, working with clients, finance, agents and growing your business. 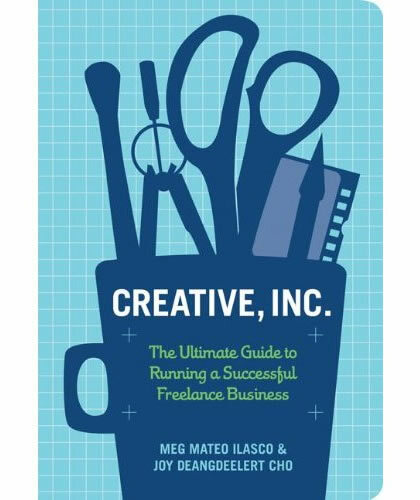 In each chapter there are interviews with different people from different ends of the spectrum discussing how freelancing affects them, and advice they have for freelancers. There is also a very good index section for looking up things quickly, and a good resource section too. Good to read all the way through and definitely something I will look back into and dip into for help and advice further down the line. I wish I had picked this up when I started!